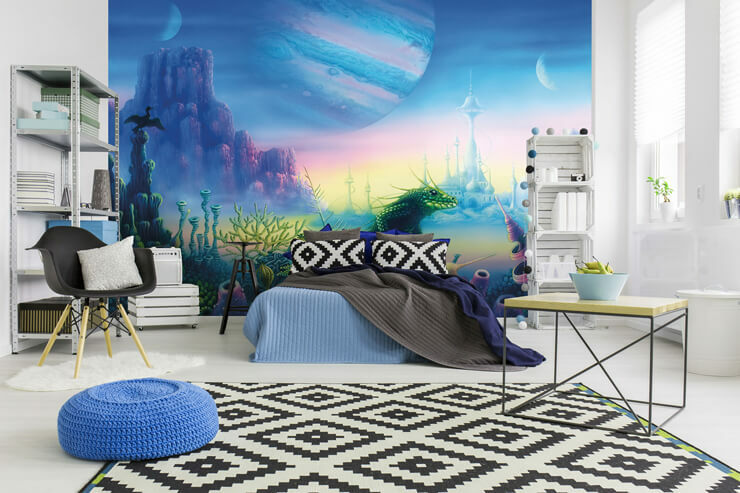 With a lifelong interest in sci-fi and fantasy, Danny Flynn’s new collection of wall murals will without a doubt, take any room to another dimension. In this exclusive interview, we delve into Danny’s passion and influences and we even learn how he creates such masterpieces. He’s also kindly shared some words of wisdom for any aspiring illustrators out there. 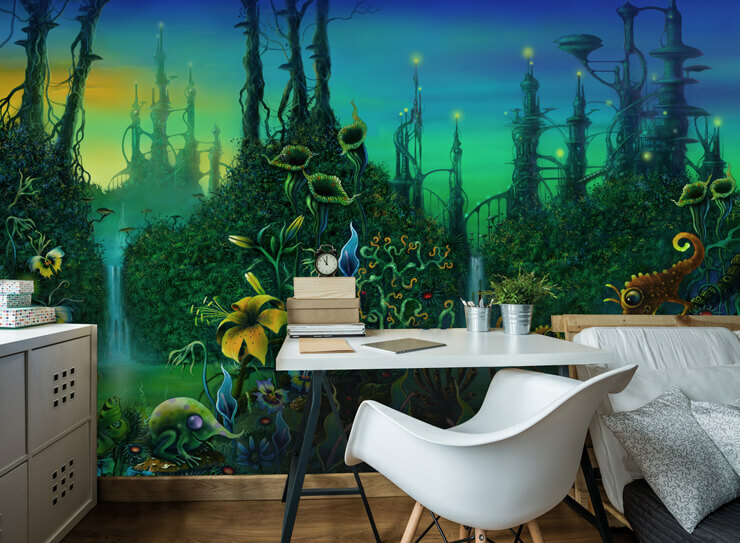 Read on to meet the artist behind some of Wallsauce’s most intriguing wall murals. When did you discover that you’d become deeply immersed in creating science fiction and fantasy illustrations? As far back as I can remember, I have always been interested in science fiction and fantasy. As a child, I have fond memories of watching Lost in Space, Stingray and Thunderbirds on the tv, doing my best to try and draw the characters. I even remember the first movie I ever went to see at the cinema, “Dr Who and The Daleks”, in glorious technicolour, with Peter Cushing as The Doctor. There was also a fantastic weekly magazine back then called TV21, which kept us informed of all the latest sci-fi news. At the same time, I was also fascinated by natural history and would constantly draw the creatures trapped within the pages of my many wildlife books. As a young teenager, I used to be a regular at my local WH Smiths in my birth town of Scunthorpe, buying books based purely on the amazing dust-jacket art. I recall the novels of Arthur C Clarke, Isaac Asimov, Robert Heinlein and especially a collection of Larry Niven short stories entitled “Neutron Star”, before moving onto the fantasy novels by the prolific author Michael Moorcock; tall tales of Dorian Hawkmoon, Elric of Melniboné and Prince Corum of the Scarlet Robe, last of the Vadhagh! Strangely enough, and frustratingly, I did very little science fiction and fantasy art whilst at college. There were few opportunities to do the work I really wanted to do... not until the final year, at last. Inspiration can come from anywhere. A cluster of shells I find on the beach, for example, may well trigger the idea for a vast spaceship. A dried-out clump of fungus may well form the basis for a make-believe alien city. When asked to illustrate the cover of a novel, I am strongly guided by the imagery of the author’s words and the story. There never seems to be a shortage of ideas, no doubt fuelled by the many thousands of hours of science fiction and fantasy movies I’ve watched over the years, as well as all the books I’ve ever read. Can you tell us a bit about how you create your works of art? All paintings begin with the simplest of doodles, usually in a sketchbook. If they’re going well, I will add more detail and colour. These ‘roughs’ serve as the guide for when I come to producing the painting. I tend to do most of my paintings on a smooth artboard surface. The best is called CS10, although it is no longer manufactured. The smooth surface contains kaolin; perfect for layering my skies first, with my trusted Iwata airbrush. Once I have mapped out my intended painting, using a pencil, the fun can then begin with the colours. I then work from background to foreground using acrylics, both paint and inks. However, in recent years I have been familiarising myself with digital illustration; a life-long learning curve I believe. As amazing as the results using Photoshop can be, the trick for us artists is trying to retain our individual idiosyncrasies and traits, otherwise, we’re all at risk of producing similar looking art. I am inspired by so many artists. I could list hundreds of them. During my mid-teens, I was introduced to the art of the surrealists Dali and Magritte, as well as becoming a fan of American artist and master of light, Maxfield Parrish. Unashamedly, I was (and still am) a huge fan of progressive rock and adored the album sleeve paintings of Roger Dean and Rodney Matthews. I should also mention the importance of music. I love to listen to the abstract and ethereal music of some of the pioneers of electronic music, particularly Tangerine Dream and Vangelis. Somehow their musical compositions are able to magically transport the listener to exotic and mystical worlds, with hauntingly beautiful and atmospheric landscapes continually unfolding... ideal as a background soundscape to help with the concentration when working. During the mid-late 1970’s, a publisher called Paper Tiger began producing compendium books by science fiction and fantasy artists; my favourites being Jim Burns, Chris Moore, Peter A Jones and Patrick Woodroffe... and then in 1994, I too had a book of my paintings published, “Only Visiting This Planet”. It was like being a fan of Man Utd, then being asked to play for them. Reaching the point I am at now, having created my own I P (Intellectual Property) - a massive undertaking, called MoonAliens. I have spent well over a decade bringing the moon to life. Deep inside the moon, there is a lush secret ‘world’, populated with well over 200 original bonkers alien characters. As well as the art, I have composed lots of music too. I have written a series of children’s novels, which I am taking to the London Book Fair just after Easter, in the hope of attracting a major publisher. The impetus to pursue this dream was encouraged by space luminaries, author Arthur C Clarke and astronomer Patrick Moore. I was fortunate to illustrate the covers to some of Sir Arthur C Clarke’s novels and got the chance to meet him in person at the Minehead Space Festivals in Somerset, where Arthur C Clarke was born. How would you describe your collection in three words? Where do you see the murals being installed? 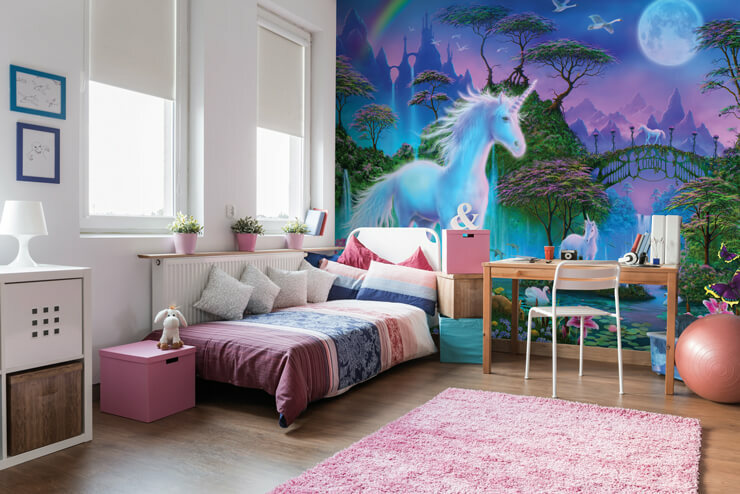 I would love to see any of my murals installed in hotel lobbies or popular restaurants, yet I would feel just as privileged to hear they were in peoples’ homes, especially children’s bedrooms. What would it mean to you to see your illustrations to take pride in someone’s home or workplace? I would be incredibly flattered and humbled. It would be a great honour that someone would choose a painting of mine to adorn their wall. Like most artists, a great deal of time, thought and care goes into creating our artworks. It would, therefore, make me feel immensely proud every time someone chose one of my paintings for their wall. 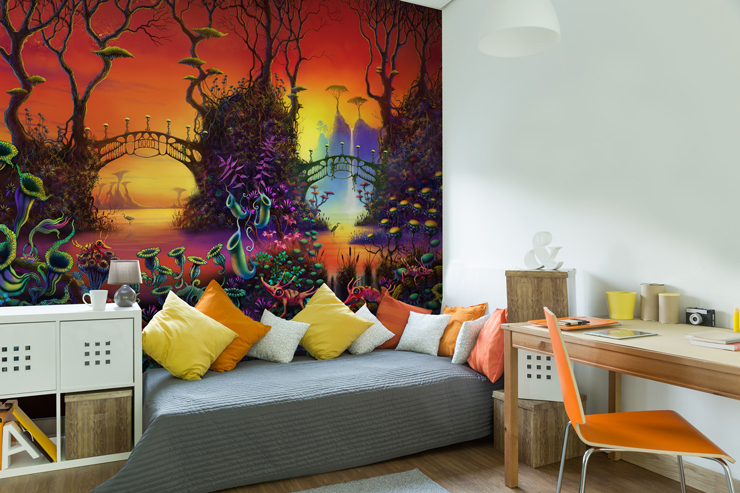 What is your favourite piece from your wall mural collection? Difficult to say but I will go with the ‘Red Jungle’ as it is my most recent painting, yet I am still pleased with ‘Quirky Castle’. Do you have any tips for anybody studying illustration or graphic design? Paint what you enjoy primarily, and absolutely believe in what you’re doing. Most importantly, keep going, no matter what. Never let anyone try and talk you out of following your passion if art is really what you wish to pursue as a career. Get into the habit of filling sketchbooks, especially if you are hoping to go to art college. Look at the work of other artists too, as there is so much to learn, observing how other artists work. Check out some of the of excellent tutorials all over Youtube. Very importantly - always use the best art materials you can afford. Honestly, your work will suffer if you don’t. Once college is over the breaks do come, yet you will need patience and perseverance as regular work may not come along immediately. Once you’re up and running, enjoy being creative... yet be prepared for the “quiet times”. Yes, the flow of work can dry up; it is a constant process of continually having to market oneself. A business card is an essential yet as soon as you can, consider building a website of your work; not every piece, just your best work. There are plenty of affordable build-it-yourself website companies out there. Most of them offer a free trial service, so take advantage of them and experiment with the templates; one of them will be right for you. Art as a career is hard work, yet it is also very rewarding... and fun too. Many people will tell you Art is a very competitive profession. It is. Thankfully - if you’re prepared to stay focused and put the hours in, there is enough work out there for all us artists... the very best of luck! A huge thank you to Danny for giving us a glimpse into his career. 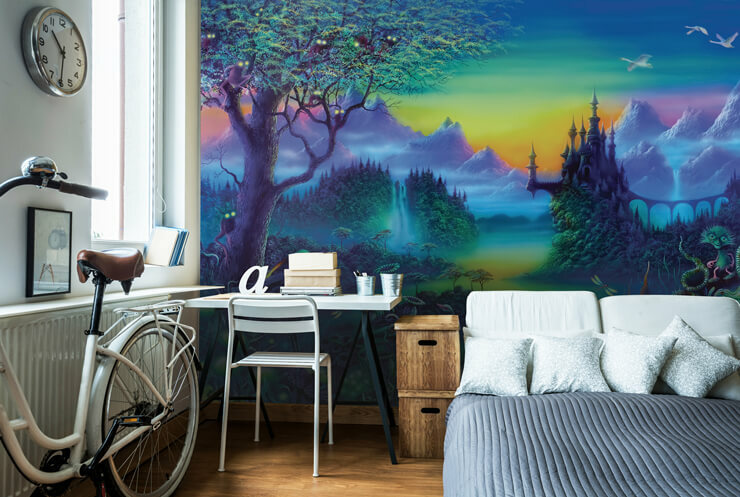 If you’re eager to learn more, visit Danny Flynn’s exclusive collection of wall murals.